Looking for more Swim for MS gear? Check out our CaféPress site, as well as our Swim for MS Partners HardcoreSport and Endless Pools! MSAA's Swim for MS website will be temporarily down for the rest of February (no new registrations for individuals, teams, etc. ), as we work to enhance your experience on the site for its relaunch in March! PLEASE NOTE: If your Swim challenge will be continuing past February 28th, 2019 or if you have any questions, please contact us at swim@mymsaa.org. 2019 is officially here! Last year, Swim for MS participants helped raise more than $33,000. Try adding Swim for MS to your resolutions list to make this year even better. More Swim News in the New Year! Check back in 2019 for more Featured Swimmers and seasonal ways you can support MSAA through swimming! Until then, register to Swim for MS this month to see if you become our Top Fundraiser for next month! Find out who was our top fundraiser! Meet Scott Cremeans. When Scott signed up to participate in Swim for MS, his goal was to swim 350 meters in one month. Read about how he blew that goal out of water! Sign up for Swim for MS this month and receive a special treat in your welcome kit. We can’t tell you what it is, but there are no tricks in our bag this month! Meet Lee Estep, who has always loved swimming, including through college beyond. Lee was diagnosed with MS in April 2016 and is committed to swimming as a means of managing the symptoms of MS. Read her story and help her reach her goal. Find out how you can connect your Swim to create a Facebook Fundraiser. Also, check out the "cool" new chair you can win if you raise $1,000 or more during September! Meet Vicki von Arx! In her first year participating in Swim for MS, she is swimming in honor of her daughter-in-law, Sarah, who is living with MS. Read her story and help her reach her goal. Any swimmer who raises $1,000 or more during August and September will be sent a Swim for MS portable chair that doubles as a cooler! Register for Swim this month to start the challenge! Meet the Stafford Swim for MS team! Not only was this the fourth year in a row that the Stafford Chapter of the National Honor Society has participated, but it was their best yet, raising more than $800 during their one-day event. Tag @MSassociation on social media AND use the hashtag #SwimSwag during the month of July, and 5 lucky swimmers will win a Swim for MS waterproof phone case! Meet Julia Cairns, participating in her third year supporting Swim for MS. Like many other participants, she was inspired by a good friend who also loves to swim and is living with MS. This year, Julia has challenged herself to swim 10 miles and raise $1,500. Show us how you splash into summer! Email us your best Swim pics or post on social media using the hashtag #SplashIntoSummerMSAA and you could be featured in our next Monthly Medley! Meet Heather Brown, who was already familiar with how MS affects daily life – her mother, sister, and several close friends are all living with MS – when she was diagnosed herself in 2015. This June marks our 48th anniversary of improving lives in the MS community! To show our appreciation, anyone who signs up for Swim for MS in the month of June will receive a waterproof phone holder. Meet Brendan Livingston, who was looking for a way to do something he loves, while supporting a close family friend who is living with MS. That's when he came across Swim for MS on VolunteerMatch.com. Check out three great tips to stay safe this summer while you Swim for MS.
Meet the latest featured swimmer, 11-year-old Yianni Kades, who is swimming in honor of his mom, who has MS, as part of his Power of One school project. How will you lend a helping hand? Sign up and create your own Swim for MS challenge, then share your story using the hashtag #MSAAVolunteer. Congratulations to Yianni Kades and The East Rec Swimmers of Oakmont for being our top individual and group Swim for MS Fundraisers for the month of March! The pool has reopened and is ready for swimmers! We’ve made a few updates to SwimForMS.org including a new, streamlined registration page and new swim stories for inspiration. Dive in to see the cool new features! March is MS Awareness Month! Honor the MS community this month by creating your own Swim for MS challenge and diving into action to help MSAA spread awareness about multiple sclerosis. Who are you swimming for? Sign up for Swim for MS at SwimForMS.org to tell your story. Congratulations to Courtney Evers of Team Dragonfly for being our Top Swim for MS Fundraiser in 2017! Sign up for Swim for MS for your chance to be the top fundraiser! Sign up for Swim for MS for your chance to be the next top fundraiser! Meet Amanda Fisher, mother of two daughters and a full-time middle school teacher with a passion for swimming. Learn how she was able to find time in her busy lifestyle to swim 300 laps in just 13 days - all for the MS community. November is a great time to celebrate family & friends...and double your impact for people with MS by swimming - learn more. Meet Phi "Swimma" Kappa, representing the Phi Sigma Kappa chapter at Georgia Tech Institute of Technology who put their skills to good use to raise awareness for MS in their community. John ran for Team MSAA at the Rock ‘n’ Roll Philly Half Marathon this past September, in honor of his grandmother (he is her primary caretaker) who lives with MS and inspired him to pursue a career in medicine. September is the start of a new school year and a new team swim season! Gather your team for a fundraising event everyone can do together, just like Team #ChampionsTakeTheLake. Rachael, who is participating in one of many nationwide endurance events on behalf of MSAA, will be running a total of 48.6 miles in honor of her father, Dan, who lives with MS.
There’s still time to invite your friends to the pool for a Swim for MS-themed pool party. Check out some themes for a great charity pool party! Adrianne Cornish, a school teacher from Kentucky, is using her summer vacation to support the MS community. She saw Swim for MS as an opportunity to honor her mother’s legacy while doing what she loves – swimming! Bring your pooch along for a dip in the pool with you! Then send us your pictures of you and your pooch or post on social media using the hashtag #DogDaysofSummer - learn more! This is Courtney Evers' fourth year putting together Team DragonFLY and participating in Swim for MS - read Courtney's story and see how her team raised more than $5,000 and swam thousands of laps to meet their goal. 10-year-old Dylan Frey's fourth grade class was challenged to put in 30 minutes of physical activity every day and keep a daily log. He chose Swim for MS and MSAA - read Dylan's story. Can you and your friends re-enact this picture, splash for splash? See how you can #SplashIntoSummerMSAA by July 6th to win a prize and be featured on MSAA's social media! Looking for more Swim for MS gear? Check out our CaféPress site, as well as our Swim for MS Partners – HardcoreSport and Endless Pools! While looking for different collegiate events to become involved with, University of Iowa College of Dentistry Team Captain, Elaine, found MSAA’s Swim for MS challenge - read Elaine's story. Stay safe this summer with these safety tips! Tami Leavens was inspired to start her own Swim challenge not only because she loves the pool, but also for others who can no longer swim - read Tami's story. The pool has reopened! Updates include: new streamlined registration page, new mobile-friendly Participant Center, new swim stories for inspiration, and updated FAQs to better answer your questions. Dive in to check out some of the cool new features! Simone Sanders has always had a love of swimming. When diagnosed with MS in 2015, Simone decided to take her passion for swimming and use it to raise awareness and funds for the MS community through Swim for MS. Read Simone's story. YOU could be the top Swim for MS fundraiser for this month! Learn how you could receive a portable 2-in-1 cooler/chair AND have a chance to receive two One-Day Park Hopper passes to Walt Disney World! MSAA's Swim for MS website will be temporarily down for a few days in late February (no new registrations, no access to Participant Centers, etc. ), as we work to enhance your experience on the site for March! PLEASE NOTE: If your Swim challenge will be continuing past February 28th, 2017 or if you have any questions, please contact us at swim@mymsaa.org. Check out more information on our updated CaféPress site, as well as our continuing partnerships with HardcoreSport and Endless Pools. As part of their school-wide community service, students will be swimming during their regularly scheduled classes and helping raise funds for the MS community! We thank the hundreds of people who participated in the Atlantic City Polar Bear Plunge on New Year's Day and helped improve lives today. Check out more information on our updated CaféPress site, as well as our continuing swimsuit partnerships with HardcoreSport and Endless Pools. As we close out this calendar year and reflect on the more than $450,000 raised through Swim for MS since its inception, we look toward our NEXT milestone...help push Swim for MS over the edge in 2017! Give thanks and share your gratitude this month or any time this holiday season by giving back to the MS community via Swim for MS. Even though the weather is turning colder, you can still Swim for MS - any pool, any time! Grab a swimming partner who motivates you and learn more. Eastern States Swim Clinic - Thank You! Earlier this month, MSAA stopped by the Eastern States Swim Clinic expo in Cherry Hill, NJ and met some amazing coaches and swimmers. Learn more about a true hero, both in and out of the pool - Courtney Evers, who raised more than $7,500 since 2011 through Swim for MS in honor of her mom who has MS...and received a military service medal for it! A new school year is here! We’ve partnered with CouponCabin so that you can raise money for MSAA just by shopping online at your favorite retail stores - for last-minute back-to-school items or swim gear! Just like our favorite summer athletes competing this August, you can earn your own Milestone Medals when you Swim for MS! Start earning your own swimming summer medals today! Need new school gear? Shopping for someone who does? We’ve partnered with CouponCabin so that you can raise money for MSAA just by shopping online at your favorite retail stores - whether for back-to-school items or swim gear! Have You Heard about MRIs? MSAA's MRI Access Fund Program has been temporarily reopened! Register today to Swim for MS and help support important programs like this for the MS community. We’ve partnered with CouponCabin so that you can raise money for MSAA just by shopping online for Swimming gear and other items at 3,000 of your favorite retail stores! Grab your friends and throw a pool party for MSAA! Or create a fun group challenge like group cannonballs to raise money for those living with MS! Thanks to all of our cyclists on their "virtual tour across the US" benefitting MSAA! Father’s day shopping? We’ve partnered with CouponCabin so that you can raise money for MSAA just by shopping online at 3,000 of your favorite retail stores! Read the inspirational story of Simone Sanders, who has MS and is swimming 1,000 laps to support MSAA. Want to add another challenge to your May agenda? There's still time to join the Great US Crossing virtual cycling ride! Need some new gear? You’re in luck! We’ve partnered with CouponCabin so you can raise money for MSAA just by shopping online. Sign up today for free! Thank you to all of our participants and to the two who received two 1-Day Park Hopper passes to Walt Disney World! AmazonSmile and #SwimForMS - see how you can help spread awareness with a simple picture. Swim your way to Disney World! New registrants in March will have a chance to receive two 1-Day Park Hopper passes to Walt Disney World! Find out who won an autographed Missy Franklin photo! MS Awareness Month is Just Around the Corner! Raise $1,000 by March 31st to receive an awesome travel Swim for MS cooler/chair combo. Learn more! Find out who won this month's autographed Missy photo! We are kicking off 2016 with a New Year Challenge! Join MSAA’s Team and work together with swimmers nationwide. The best holiday gift is when we give back to others. See what swimmer Erin Magee has accomplished in her December Swim for MS so far. November is a great time to celebrate family, friends, and good food...but don’t forget to continue to give to those in need. Don't be a ghoul, get in the pool! Team DragonFLY raised 4x their Swim goal to help mom Elaine (diagnosed with MS in 2005) & others in the MS community! See their pics, hear their story. Dog Days of Summer are here! Don’t Swim for MS alone - bring your pup for a dip & share pics! Learn how you can help their August Swim event and mom Elaine, who was diagnosed with MS in 2005. Join the Cajun Cannonballs and register to Swim for MS! Get your friends and family involved, start cannonballing, and post your #SwimForMS pics! Splash With Us All Summer Long! If you weren’t able to join our #MemorialDaySplash, not to worry! We're continuing to #SplashForMS all summer long! Students at Leman Manhattan Preparatory School swam laps for pledges and raised more than $4,000 for the MS community! Splash for MS this Memorial Day! Help us with our biggest Swim for MS splash yet - join our Splash for MS Memorial Day Team! Send us your pictures to be featured as the main image on our Swim for MS fundraising site! Sign up for Swim for MS this month and receive a Swim for MS waterproof phone pouch! View their captain's inspiring story captured by 6ABC Philadelphia, and organize your own team event. MS Awareness Month is here! Find out how you can have a chance this month to receive two One-Day Park Hopper passes to Walt Disney World! Check out our brand-new "Swim for MS - Get Started!" video to learn more about how to get started and to see pictures of past participants and teams! During MS Awareness Month, proceeds from suits on SwimOutlet’s Swim for MS Shop site and Swim & Sweat's 10% off discount purchases will help us Improve Lives Today! Check out more information on our updated CaféPress site, as well as our continuing swimsuit partnerships with HARDCORESWIM and Endless Pools. Next month is MS Awareness Month! Check out all the great ways we were able to help the MS community last year with the help of our fundraisers. Proceeds from each suit found on SwimOutlet’s Swim for MS Shop site will help us Improve Lives Today! New Year, New Swim Challenges! In 2015 we want to challenge everyone to stay fit, spread the word, get involved, and help the MS community. Swim for MS is the perfect way to do just that! Chloe Cohen and Francisco Suro were the first two participants to exceed $3,000 in Swim donations between October 1st and January 1st! Celebrate the season with loved ones by offering your support to those who need it most. Swim for MS is a great way to keep fit and give to the MS community. Join today! ...the more we can improve the lives of those living with MS. Raise $3,000 in donations by January 1 and be eligible for a chance to receive a $50 Visa Gift Card! Just Keep Swimming - Through the Holidays! Sign up for Swim for MS and raise $3,000 in donations by January 1st for a chance to receive a $50 Visa Gift Card. Get your team together and show us how spook-tacular you can be! Congratulations to the lucky recipients of our Swim for MS cooler/chair combo. Meet the PBC Pirates and see how they raised over $1,000. Swim in style this fall with your new #SwimSwag. Only one month left to get your portable beach chair! SwimForMS.org is now mobile friendly! Any Pool, Any Time...Any Device! Check out the list of lucky Swimmers who won a Swim for MS custom swimsuit. Learn how you can get these items from Swim for MS! Check out more information on our updated CaféPress site, as well as our continuing swimsuit partnership with HARDCORESWIM. Happy Independence Day all month from MSAA! In celebration of America’s independence this month, challenge yourself to give back to the community. Do at least one thing for someone in need in July. All participants who sign up for Swim for MS during the month of July will be entered into a drawing to receive a custom swimsuit. Take a selfie in your Swim for MS swag, post it on social media, and use the #SwimSwag hashtag. MSAA has been helping to improve lives in the MS community for over 44 years! This June marks our 44th Birthday. MSAA is giving away Reusuable ChicoBags to every participant who registers in June! Sign up this month to receive your official Swim for MS welcome kit, as well as our new Swim for MS ChicoBags! Time to have some fun! Invite your friends to the pool and have a Swim for MS-themed pool party! We love our Swim for MS Ambassador Missy Franklin - she is quite the inspiration! Help MSAA wish Missy a Happy Birthday on May 10th, 2014. MSAA is giving away Swim for MS swim caps to every participant who registers in May! Sign up this month to receive your official Swim for MS welcome kit, as well as our new Swim for MS swim cap! The warmer weather is for fun in the sun! Do you belong to a swim club or lifeguard association? Create a fun day of fundraising and competition with your team. Spring is a great time to get involved with your local community. Invite your family, friends, & co-workers to pledge with you for Swim for MS! Be a leader in your community and organize a Swim for MS fundraiser at your local fitness center! Create a team, have your friends and family join, and coach them toward success! Be a leader and make a difference in the MS community today. Thank you to everyone who signed up and supported Swim for MS during MS Awareness Month! Please help us congratulate Jamie Chadwick & Charlie Cooper! We randomly selected these two participants who registered during the month of March to receive (2) 1-Day Park Hopper Passes to Walt Disney World in Orlando, Florida! Our new Swim for MS online Aquatic Center has officially launched! The Aquatic Center also includes inspirational videos about individuals who Swim with MS.
Our new online Swim for MS Aquatic Center will launch on Tuesday, March 18th and will include resources, tips, and inspirational stories! Be sure to check out this new addition to our site soon at SwimForMS.org! March is MS Awareness Month and MSAA has partnered with Wearable Hope to create an exclusive Swim for MS t-shirt! The “Journey” Shirt (right) sells for $20.00 on their website and $10.00 of every shirt sold is donated to MSAA! Walt Disney World and MS Awareness Month! Mark your calendars because Walt Disney World Company has donated four one–day Park Hopper passes in support of MS Awareness Month this month. Two lucky Swim for MS participants have a chance to receive two One-Day Park Hopper passes to Walt Disney World! This opportunity is available to new registrants during the month of March. MSAA’s current Swim for MS website will be temporarily down on Friday, February 21st. At this time, all participant pages will be inactive and will not accept donations. Access to the Participant Center will be closed. We will re-open registration on Monday, March 3rd for the 2014-2015 Swim for MS campaign. If you have any questions about this Swim for MS update, please let us know by emailing swim@mymsaa.org. Start the New Year off by either inviting a friend to participate in Swim for MS to help us meet our 2014 goal or pledging to support the MS community - find out how you can get involved this year. Thank you to all swimmers who submitted their swim stories! The period for stories to be submitted is now closed. We'll be selecting our featured stories by February and showcasing them in new inspirational videos later this year! Check out more information on our CaféPress site, as well as our swimsuit partnership with HARDCORESWIM. Check out these ten tips to get you started on supporting your Swim! Still unsure about swimming in general? Read about these swimming benefits. Exclusive Swim for MS swimsuits are still available from HARDCORESWIM for purchase. Two different Swim for MS-style suits are available for men and women. Check out the Swim for MS page on their site and order your suit today! Check out some prepared requests for support you can post on your social media websites to get the word out on your Swim! Did someone say POOL PARTY?! Find out some themes for your Swim for MS pool party! MSAA has partnered with HARDCORESWIM to provide exclusive Swim for MS swimsuits available for purchase. here are two different Swim for MS style suits are available for men and women! Check out the Swim for MS page on their site and order your suit today! MSAA is pleased to announce our partnership with HARDCORESWIM to provide exclusive Swim for MS swimsuits available for purchase. Two different Swim for MS styles are available for men and women! Check out the Swim for MS page on their site and order your suit today! Anyone that raises at least $150 during the month of June and tags a picture of themselves swimming or in their Swim for MS t-shirt on Facebook or Twitter will be entered into a raffle to receive a HARDCORESWIM Swim for MS suit. MSAA congratulates Missy Franklin on being named the 2012 James E. Sullivan Award winner as the nation's top amateur athlete! MSAA's Special Swim for MS May Prize...is a Modify Watch! Anyone who registers for Swim for MS will be entered to win a Modify Watch! Modify Watches are interchangeable watches allowing an individual to mix-and-match faces and straps to create the "Mod" that best suits you! 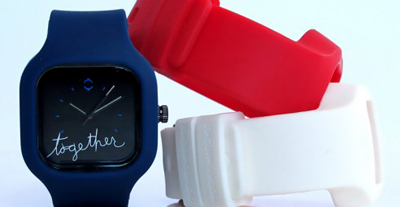 Browse the Modify Watches blog for more information on their nonprofit collection and how to purchase a "Together" watch. MSAA congratulates Missy Franklin on being named the 2012 James E. Sullivan Award winner as the nation’s top amateur athlete! Beginning in March, the top fundraiser for the previous month will receive an autographed photo of Missy Franklin, providing the minimum amount raised is $500. March will also mark the debut of the Swim for MS e-newsletter, which will include an announcement of monthly prize winners, fundraising and swimming tips as well as general information about Swim for MS and MSAA. MSAA is pleased to announce our partnership with SwimOutlet.com, our national distribution sponsor.